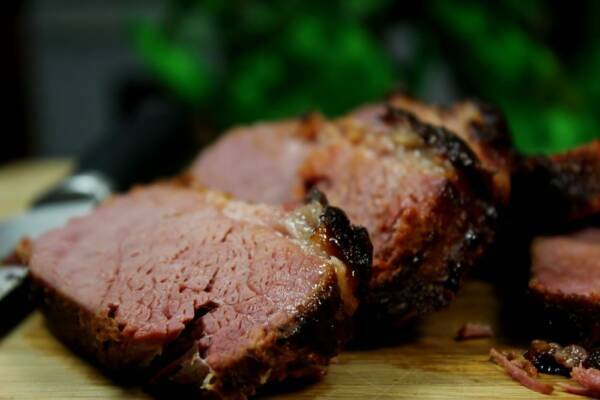 Smoked corn beef brisket for St. Patrick's day is not only traditional.. it's melt in your mouth good. In this recipe I will show you how to cook it up right. 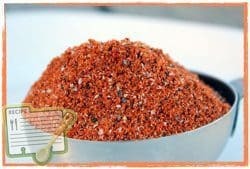 My original rub recipe (purchase recipes here) is the seasoning to use on these for a perfect exterior on every slice. 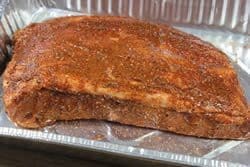 My original rub is the perfect seasoning for this smoked corned beef brisket flat to flavor the meat and to create a beautiful crust on the outside of every delicious slice. 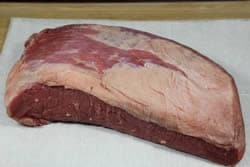 The process of corning a beef brisket flat adds a lot of salt to the meat. Some of this excess salt can be removed by soaking it in water for at least 4 hours (overnight is even better). 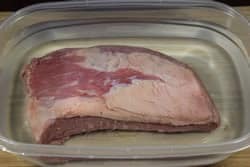 Simply place the brisket flat into a container and cover it with cold water. Place it in the fridge while it soaks. When it is finished, remove it from the water and dry with paper towels. 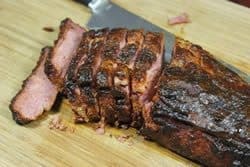 The flavor we are going after on this smoked corned beef brisket needs only a little Dijon mustard and my original rub recipe (purchase recipes here). Note: It's a great idea to put the meat down into a foil pan at this time. This contains the mess and allows the juices to collect around it while it's cooking. This also makes it easy if you decide to cover with foil later in the cooking process. Then add enough of my original rub (purchase recipes here) to cover generously and massage it in to make a thick paste all over the meat. The mixture of the mustard with the rub will create a delicious crust on the outside of the meat. Set up your smoker for cooking at about 240°F using a mixture of hickory and peach smoking wood or whatever you have available. Set the pan with the corned brisket on the grate once the smoker is ready. You can expect about 6-8 hours to reach 195°F depending on how thick the meat is, how well your smoker holds the temperature, and other variables such as wind and ambient temperature. I recommend keeping the smoke going for at least 4 hours. Don't change anything– just let it keep cooking as is until it reaches the desired temperature and tenderness. If you placed the meat in a pan, this will be an easy task. Just cover the top of the pan with foil and let it continue cooking until it reaches the desired temperature and tenderness. If you chose to put the meat directly on the grate, wrap the meat in foil or place it into a foil pan at this time and let it continue until finished. Note: I get this question a lot: Can you move the meat to the oven now that's it just needs heat to finish? Well of course you can and it will do just fine. Use a digital probe meat thermometer such as the Maverick ET-733 to monitor the temperature of the smoked corned beef brisket while it is in the smoker. This type of thermometer allows you to know the temperature of the meat without having to open the door of the smoker. 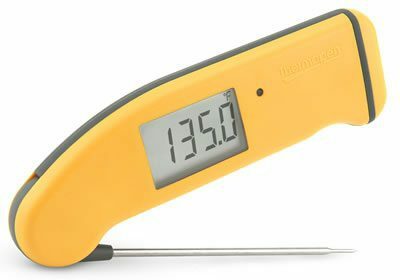 Note: You can also use the Mk4 thermapen to check the temperature of the meat once it is close to being finished. 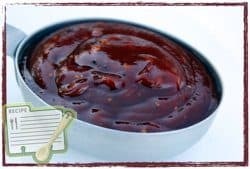 When the meat is almost finished, I like to baste the meat with a tasty sauce made by mixing Dijon with my barbecue sauce at a 1:1 ratio. 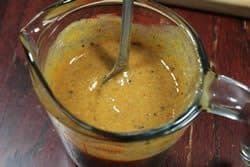 I use ¼ cup Dijon mustard and ¼ cup of my barbecue sauce (purchase recipes here) and mix it up real well. This sauce is brushed on when the meat reaches 180°F and then once again when it reaches 190°F. Be gentle and try not to disturb the crust too much during this process. When the meat reaches about 195°F and you have ascertained that it is tender to your liking, you can remove it from the heat and allow it to rest for at least 30 minutes with foil tented over the top of it. 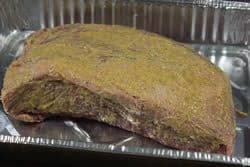 If you wrapped or covered the meat with foil and have the time, place the wrapped brisket flat into an empty cooler. Place a towel or two on top and then close the lid. Let it stay in this configuration for 1-2 hours for further tenderizing. Once the meat is finished resting, slice it about ½ inch thick across the grain and serve right away. Serving suggestion: place a container of warm Dijon barbecue sauce (recipe above) on the table for a dipping sauce. 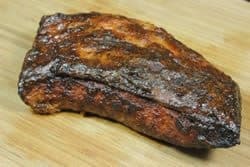 Smoked corn beef brisket for St. Patricks day is not only traditional.. it's melt in your mouth good. In this recipe I will show you how to cook it up right. Soak corned beef in water to remove excess salt for at least 4 hours (overnight is better). Dry meat with paper towels and place into a foil pan. Cover meat with Dijon mustard and Jeff's original rub. 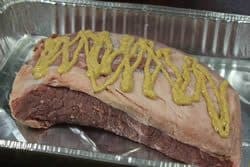 Massage the rub/mustard to cover the entire brisket flat. Set up smoker for cooking at about 240°F with a mix of hickory and peach or other smoking wood. Once smoker is ready, place pan with brisket onto grate and keep the heat and smoke going for at least 4 hours. After 4 hours the brisket can continue to cook with just heat for an additional 2-4 hours or until it reaches 195°F in the thickest part. Baste the meat with a mixture of ¼ cup Dijon and ¼ cup of Jeff's barbecue sauce when the meat reaches 180°F and again at 190°F. When the meat reaches 195°F and is tender to your liking, remove from the heat and allow it to rest for at meat 30 minutes tented with foil over it. Slice the meat across the grain into ½ inch pieces and serve. Hey Jeff, I own your book and happened upon this wondering if I could even smoke a corn beef. This started as an experiment to see if it was possible but, ended up being the brisket of the day out of the 5 we cooked. Smoked a small 2.5# with apple and cherry chunks in a 8×8 pan and it worked out really well. Simple mixture of mustard and a pretty made seasoning was all it took. Thanks for the advice and tips for cooking this. Delicious! I’ve made this a few times now. It’s really delicious. I don’t use the bbq sauce at the end, just the dry rub and mustard. Letting them soak probably removes some of the salt, but the corned beef can still be quite salty. I suppose that depends on the brand and your taste for salt. For me, I like them just fine after soaking for 4 hours. I’ll be filling my chest freezer with more corned beef briskets this year during st. patty’s day again. Definitely different, not beef brisket, not corned beef, not pastrami, yet similar to all. Personally for me, I really liked it, wife not so much (likes brisket, not corned beef). It was VERY salty, but probably my own fault, I only soaked for 4 hours. I saw the meat getting pale at 4 hours and didn’t want it “watered down”. Guess it also depends on the processor of the corned beef. Bought it for under $2/# @ st. Paddy’s day, figured why not, beef brisket is closer to $5/#. It was tender!!! Melt in your mouth tender. Bought rye bread with good deli mustard and replicated Katzs deli in NYC. 6 hours for 3.3 #. Smoked with 50/50 pecan & apple, great flavor. Hit 160° @ 4 hours. Covered alum pan with foil and cooked another 2 hours. Did not use mop sauce, didn’t want to add more sodium. Didn’t need it. I would do it again, just soak all night. Corned beef hash for leftovers (don’t add any salt!) later on week, I’ll just let my sodium levels drop beforehand. Did one up for St. Paddy’s day. Came out so good, I was asked to do another that Sunday! Tried this last Saturday and it was tremendous. Another home run recipe Jeff! I was only able to soak the brisket for 3hrs but it was only slightly salty. I put a little less salt in the rub. I used Cherry wood as well. Amazing! Did this recipe yesterday. Very good, I did not use the pan and put it right on the racks so that it caramelized all the way around. Good choice of wood smoke was nice and we’ll be doing it again! Do you leave it cooking in the pan the entire time? It appears there is a lot of liquid that is in the pan now and I don’t want it to steam or get soggy.. Should I take it out of the pan and leave it on the grate for a few hours? One thing is, how much salt and other spices to add to the water to brine the meat? The usual 1 Qrt. water, 1C salt? This is one recipe that I would love to try. The water in this recipe is not to brine the meat but rather to help remove some of the salt. In the meat called for in this recipe, the “corning” process has already been performed whether you’ve done that yourself or purchased one already corned. We smoked a 5# corned beef brisket flat over the weekend, and it turned out great. I was out of hickory and peach chips, so I used pecan, and cherry. I only soaked the flat for three hours, but it wasn’t too salty for the very tasty Rubens we made with the finished product. We sliced the meat very into very thin strips on an electric slicer. 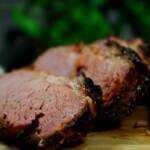 Question…doesn’t smoking corned beef turn it into pastrami? Sounds like a delicious meal! You are correct.. smoked corned beef brisket is pastrami. Chet, I will send copies of the recipes to you right away.